1. One of the two midwives who were ordered by Pharaoh to kill all the Hebrew male children (Ex. i. 15). Philo ("Quis Rerum Divinarum," ed. 1613, p. 389; ed. Schwickert, 1828, iii. 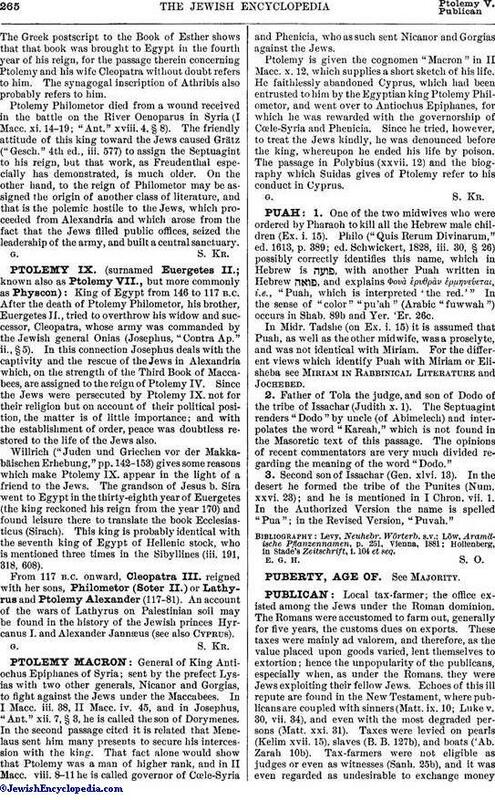 30, § 26) possibly correctly identifies this name, which in Hebrew is , with another Puah written in Hebrew , and explains Φουὰ ἐρυθρὰν ἑρμηνεύεται, i.e., "Puah, which is interpreted 'the red.' " In the sense of "color" "pu'ah" (Arabic "fuwwah") occurs in Shab. 89b and Yer. 'Er. 26c.In Midr. Tadshe (on Ex. i. 15) it is assumed that Puah, as well as the other midwife, was a proselyte, and was not identical with Miriam. For the different views which identify Puah with Miriam or Elisheba see Miriam in Rabbinical, Literature and Jochebed. 2. Father of Tola the judge, and son of Dodo of the tribe of Issachar (Judith x. 1). The Septuagint renders "Dodo" by uncle (of Abimelech) and interpolates the word "Kareah," which is not found in the Masoretic text of this passage. The opinions of recent commentators are very much divided regarding the meaning of the word "Dodo." 3. Second son of Issachar (Gen. xlvi. 13). In the desert he formed the tribe of the Punites (Num. xxvi. 23); and he is mentioned in I Chron. vii. 1. In the Authorized Version the name is spelled "Pua"; in the Revised Version, "Puvah." Hollenberg, in Stade's Zeitschrift, i. 104 et seq.